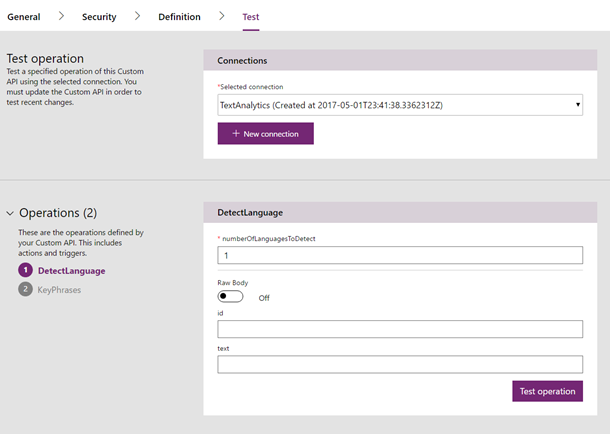 We are excited to announce the availability of a brand new Custom connector (previously called Custom API) experience in PowerApps! If you have used the Custom connector experience in Microsoft Flow, you are probably already familiar with it – today, we are making that same experience available in PowerApps as well! 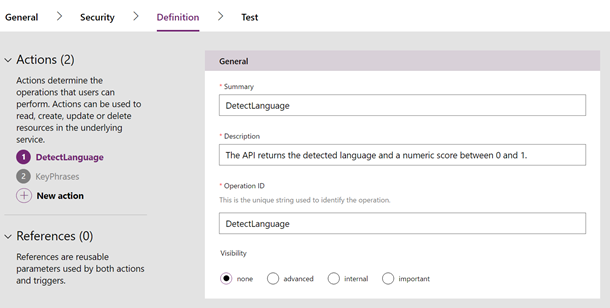 Custom connectors allow you to connect to any RESTful API endpoint, which you can then integrate with PowerApps. We have received feedback from a number of our customers that creating an OpenAPI (previously called Swagger) definition file for your API is not easy. So, we are now bringing to you a new experience which will make it much easier for you to create custom connectors for PowerApps. In addition to creating a custom connector using a OpenAPI definition file or a URL to OpenAPI definition, you can now create a custom connector using a Postman collection. Postman is a powerful tool to make your API development faster and easier. With a Postman collection, we will automatically generate a OpenAPI definition for you and make custom connector creation simpler. Operations that are defined in your OpenAPI file or Postman collection are pre-populated in the Definition tab. However, if you want to add new operations to your custom connector, you can do that by selecting “+ New action” in the left pane. You can also edit existing operations in this experience. 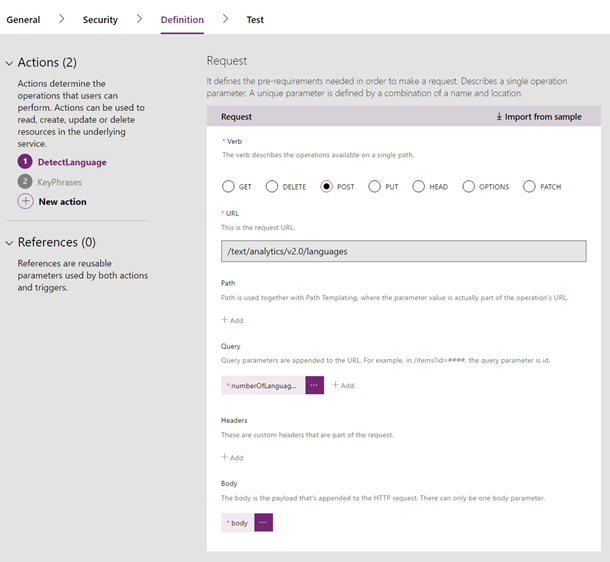 In addition, we have now made it easy for you to define the Request and Response for the operation in your custom connector, by using an existing sample request or response. All you have to do is choose “Import from sample” option, for the Request for Response and paste in the sample. Once you have created your custom connector, you can test all operations in the custom connector in the “Test” tab, to ensure your custom connector works as expected. First, you will need to create a new connection to the custom connector by clicking on the “+ New connection” button, then choose the operation you want to test in the left pane, provide the input parameters if any and click on “Test operation” to test your custom connector operation. If the call was successful, you will be able to see the valid response. You will now be able to download the OpenAPI definition file for your custom connector from the custom connector list, by clicking on the arrow button. Note: We are now calling “Custom APIs” as “Custom connectors”. We are also replacing references to “Swagger” with “OpenAPI”. We are in the process of updating these names across PowerApps – however, you may find these names being used interchangeably in docs, blogs or in the product over the next couple of weeks as we make the updates. We will be continuing to add new features and make improvements to this experience. So, we would love to hear your feedback. Please do reach out to us with any feedback about this new functionality via the PowerApps community site. Thanks!